SCOTTISH WILDCATS COULD BE EXTINCT WITHIN MONTHS ! 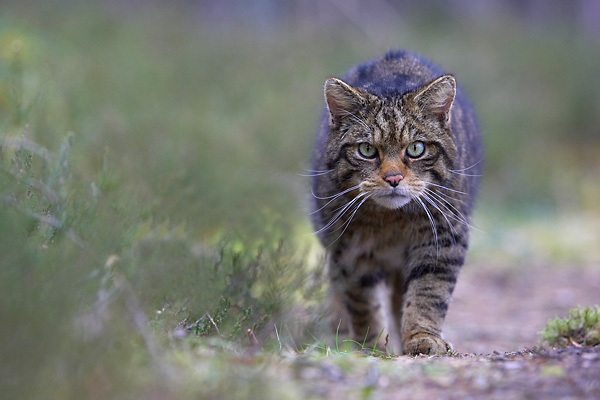 A team from the Scottish Wildcat Association (SWA) reviewed 2,000 confirmed sightings, SWA said the analysis suggested there could be 35 wildcats – far fewer than previously thought. Other research has estimated that there could be less than 400 pure-bred cats. Last month, a report on a project funded by Scottish Natural Heritage (SNH) estimated that there were 150 breeding pairs left. Disease and inter-breeding are the two main threats to numbers of pure-bred wildcats. Of the 2,000 records of hybrids and wildcats looked at by the SWA team less than 20 were deemed to comply with the accepted coat-marking identifiers of the true wildcat. With an estimated 3,500 hybrids in Scotland the SWA said this would mean there were just 35 wildcats remaining. “However you juggle the figures it’s hard to find anything positive. “If you ignore the eyewitness sightings because they’re unreliable the numbers get even worse. Scottish wildcat conservation project Highland Tiger has created this official introductory film explaining the issues faced by the Scottish wildcat and what can be done to help these amazing animals. Author RayDvDPosted on September 13, 2012 September 13, 2012 Categories NewsTags BBC, Cat, European Wildcat, fishing and wildlife news, Highland Tiger, hybrid, Scotland, Scottish, Scottish Natural Heritage, Scottish Wildcat Association, Wildcat, wildcatsLeave a comment on SCOTTISH WILDCATS COULD BE EXTINCT WITHIN MONTHS !